Few roads can match Route 20's beauty, history, or contribution to New York's vitality. In 1926, Route 20 became a federal highway and evolved into New York's foremost east-west road. But unlike most early highways, it has survived almost completely intact. The story of Route 20 is told through more than 200 vintage postcards showing scenes from the Shaker communities in Columbia County to the Lake Erie Shore. The postcards show the personality of the road: main streets, the Finger Lakes, and scenic vistas. Not to be forgotten are the tourist courts, hotels, diners, and gas stations that made travel possible. 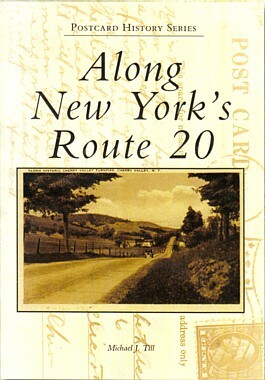 Along New York's Route 20 is part of the Postcard History series. Michael J. Till is a retired university professor. He grew up on Route 20 and has had a lifelong interest in the road. All illustrations are from his personal collection of more than 2,000 vintage Route 20 postcards.